Known as the “Pearl of the Orient”, Penang is the second smallest state in Malaysia after Perlis. It is one of the most developed states and at the same time maintaining its historical and cultural aspects. Visitors from local and around the world love Penang as a great holiday destination due to its diversity. Visitors can go sailing in the sea along the beaches in Penang. 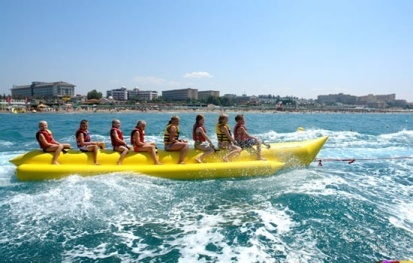 It is a popular activity as most of the seaside hotels and resorts operate catamarans and dinghies. For beginner, you may opt for some sailing lessons offered here too. For nature lovers, you should go for jungle trekking at the Penang National Park located at Teluk Bahang. Some other trails will lead you to the Monkey Beach and Kerachut Beach. Along the way you will see jungle streams and waterfalls. Visitors can even watch the turtles lay eggs on some nesting sites here in the National Park as well. Horseback riding is another activity available in Penang Turf Club and Countryside Stables Penang. Other than that, you may also ride a horse along the beach or through the rolling hills of the island. It is a good exercise while riding around enjoying the beautiful scenery and natural environment. Most of the hotels do arrange horseback riding for the visitors upon request. For beach lovers, there are plenty of beach activities to try on like canoeing, snorkeling, waterskiing, windsurfing and fishing. For something more adventurous, you may try on parasailing and scuba diving as well. Most of the equipments are available for hire at affordable price. These activities are available in beaches like Pulau Bidan, Pulau Song and Song, Pulau Telur off Batu Ferringhi and many more. Diving is a great activity in Penang as there are variety of coral reefs and shipwrecks to see off the coast of Penang. In addition, diving in the tropical waters attracts many visitors all year round. Some of the famous diving spot is Pulau Payar, Pulau Kaca and Pulau Lembu. Home to more than 400 tropical bird species, the Penang Bird Park is a wonderful stop for birds’ lovers as well as family with kids. The park is located in a large landscaped site in Seberang Jaya at the mainland. Besides, you will see lots of plants species, manmade islands and waterfalls inside the park as well. On the other hand, visit the world’s first tropical butterfly farm which is the home to more than 4,000 Malaysian butterflies, at about 120 species. Children will love this place that also has a living museum which provides public education and research facilities. Visitors will be able to view the butterflies at a close distance when they fly around their favorite nectar-producing plants. The famous Snake Temple is believed to be the only temple of its kind that visitors cannot find anywhere else in the world. There are many snakes that coiled around the pillars and some on the floor wandering freely in the temple. The snakes are said to have their venom removed and so far there is no incident recorded that visitor bite by the snakes. It is a temple built to worship the deity Chor Soo Kong. Meanwhile, you may then visit the Wat Chaiyamangalaram, a Thai style temple that house a 33 meters long reclining gold-plated Buddha. It is the world’s third largest reclining Buddha.